The Adventure Island at Glover’s Reef Second Half itinerary is our shortest package to our private island in Belize. This is the second half of the full week private island trip, and always starts on a Tuesday. 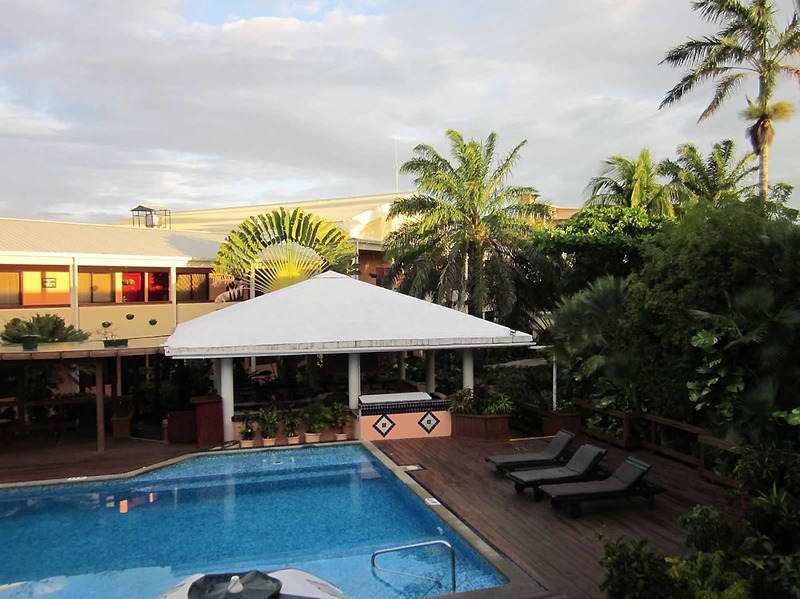 You stay the first and last night in Belize City, with 3 nights on the island. We meet late in the day on Day 1. You might be able to fly to Belize from your home airport in one day. However, we recommend you come one full day early if you can (so that possible flight delays won’t cause you to miss the boat to the island, which leaves early Wednesday.) This is fully explained on Our Hints for a Better Vacation page. Our daily schedule on the island is flexible and depends mostly on the weather. The exact itinerary varies from week to week. This description is how a typical trip will likely unfold. Fly to Belize. Take a taxi to the Belize Biltmore Plaza Hotel for a 5:30 p.m. meeting, followed by dinner and overnight. Your guide will wait for everyone before starting the orientation, and attendance this evening is required. See our Belize City map for more information on the location of the hotel. If arriving early by one or more days, consult our list of hotels in Belize City or our top ten things to do in Belize for recommendations for extra days in the country. After an early breakfast the group walks to our dock two blocks from the hotel, while luggage is driven. The boat to Glover’s Reef leaves between 8 and 9 a.m., arriving just before lunch. It is a 3 – 3.5 hour ride (65 miles). We cross the Belize Barrier Reef at Tobacco Caye, continuing out to Glover’s Reef. See our map of Belize for an overview of our crossing. Arriving on Long Caye, we begin with a complete tour of our facility. Lunch will be ready after the tour, and then you settle into your very own Belize beach hut. By 1:30 or 2:00 we get back together for our first sport orientation: snorkeling! 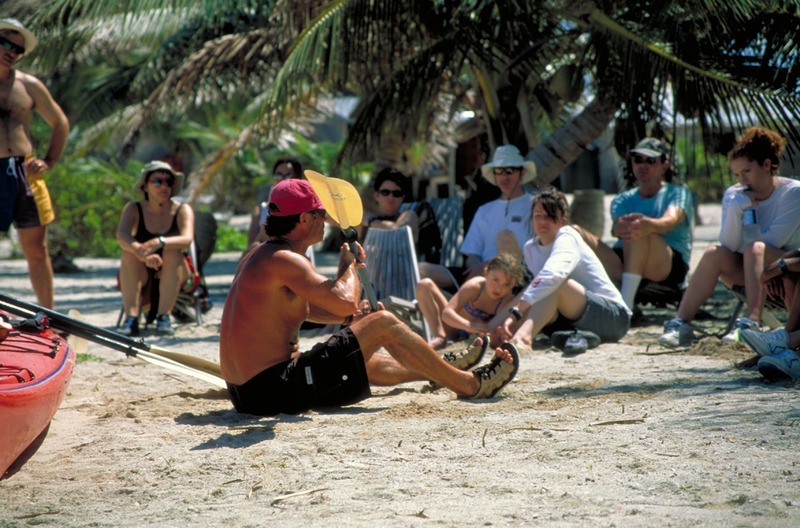 Everyone participates in this session, as well as the sea kayak orientation the next morning. After that all other sport orientations can be offered multiple times. We only offer these sessions once, which is why they are required. Our snorkeling orientation includes a review of gear and snorkel safety. We break into smaller groups to swim to our closest snorkel spot for your first snorkeling experience at Glover’s Reef! From now on you may snorkel as much as you like, as long as you run your snorkel plan by us first, and have a buddy to join you. Group snorkel tours are scheduled throughout the week, usually daily and often twice a day. 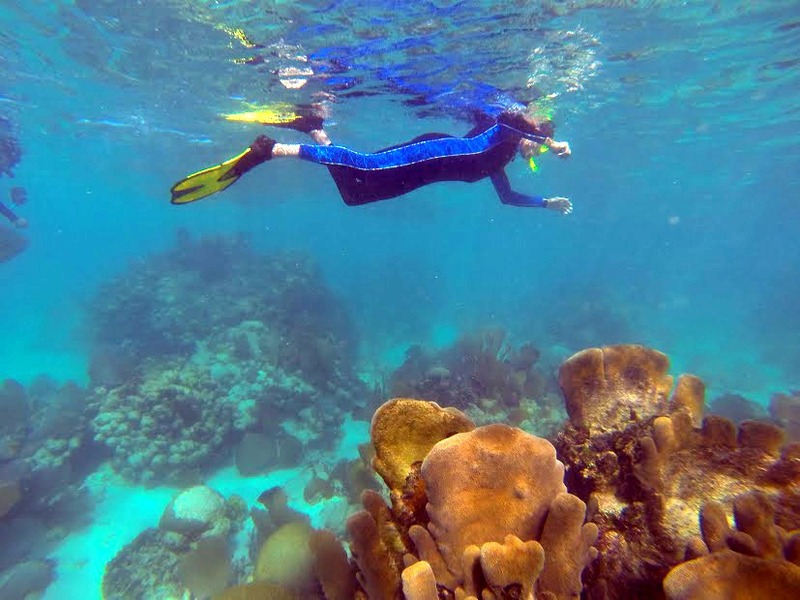 View our Belize snorkel map to see just how many snorkel sites we have easy access to. This morning we complete the sea kayak orientation, which starts off on land, followed by a practice session in the water. We cover paddle strokes, getting in and out of the kayak without tipping over (so you can snorkel from your kayak). Also we teach everyone how to rescue each other so you can paddle on your own with a buddy. The water is 80 degrees, it’s the perfect place to practice these skills. This session is the last mandatory activity. From now on you can choose what you want to do, no other sport orientation is required. After lunch, one guide takes a group paddling to “The Horseshoe”, a nearby patch reef to practice what we just learned. Another guide offers surf kayaking instruction, which is a short session on land before you paddle out to catch your first wave! Surf Belize! All surfers, regardless of past experience, start with kayaks, then move up through paddleboard surfing and finally board surfing. Experienced board surfers will not be disappointed as our surf boards are chosen specifically for our wave. Certified divers may skip these afternoon activities and instead go diving with the dive shop crew, and fishermen can fish anytime. We pay for your fishing license so you can begin fishing right away. Independent kiteboarders can also kitesurf whenever conditions are good. We provide the boards only, you need to bring all of your other gear. The first PADI diving course is offered this morning. This class allows newbies to learn to dive without becoming certified. 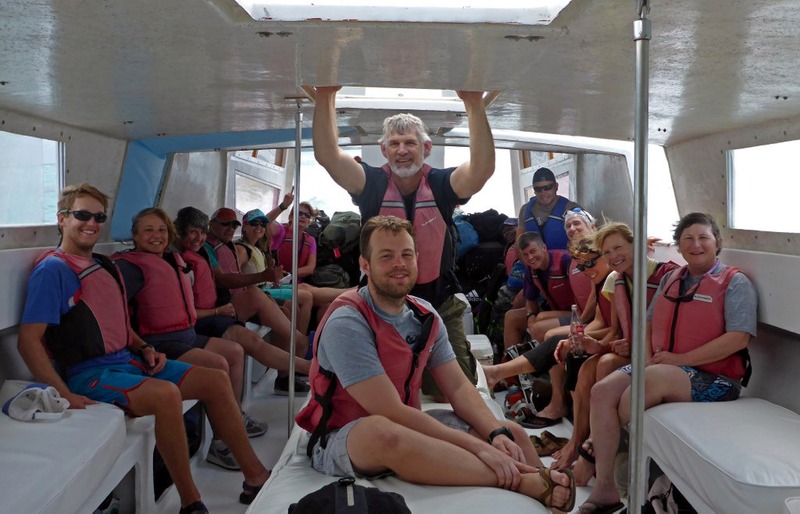 Others paddle five miles round-trip to Middle Caye to tour the Marine Research Center, a home base for working marine biologists. Once there we can tour the island, or go snorkeling at a great snorkel spot right offshore. Fishermen will want bring their gear to fish the bonefish areas surrounding the island. We paddle back to Long Caye in time for a late lunch. If you don’t want to learn to scuba dive or to paddle to Middle Caye, you can always stay on the island. With a buddy you can do any of the sports you have already learned, or just relax in your hammock. 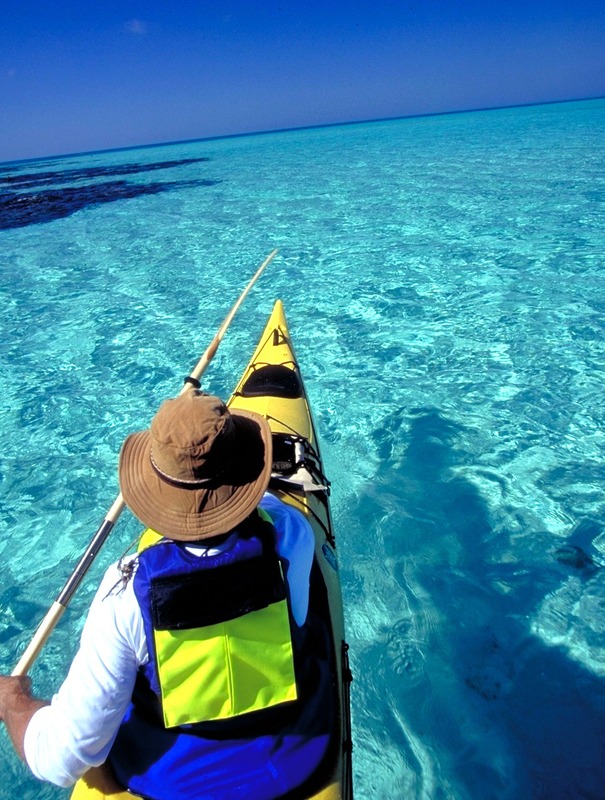 We can also leave a guide behind from the Middle Caye paddle to take a group kayak snorkeling. 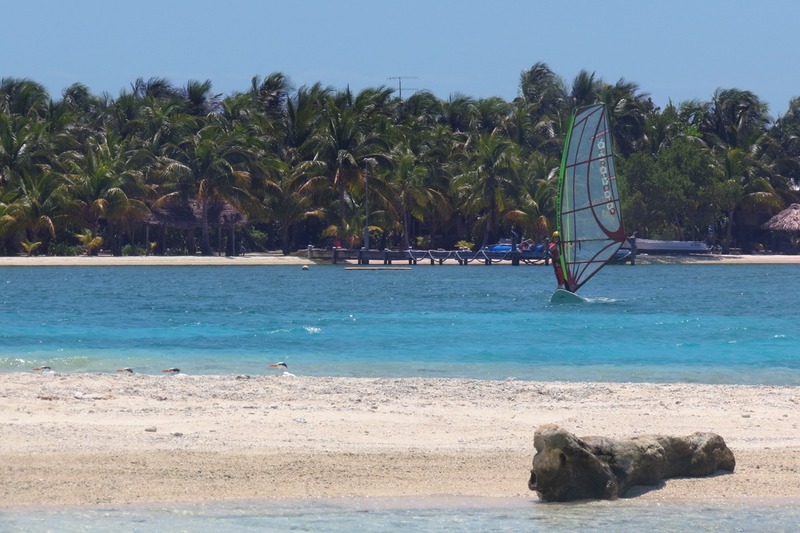 Independent kiteboarders can kitesurf any time, and we also offer kitesurfing lessons at our Belize kiteboard school. One group paddles to “The Aquarium”, a shallow patch reef about a half-mile from the island. 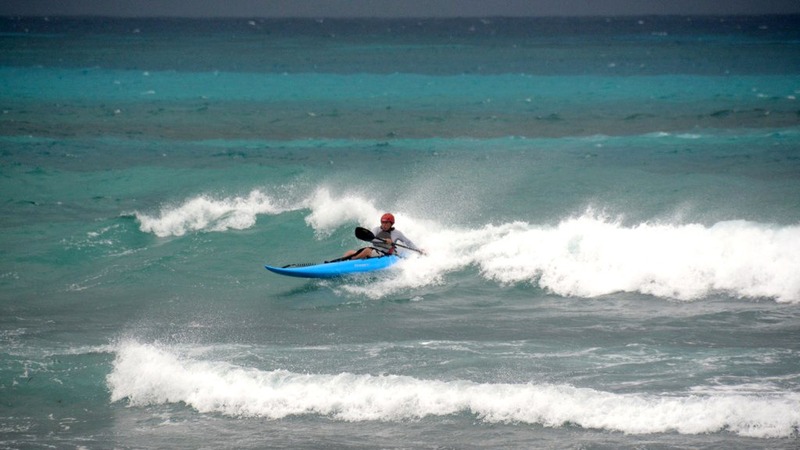 We will also offer windsurfing and paddleboarding for guests who want to try these sports. 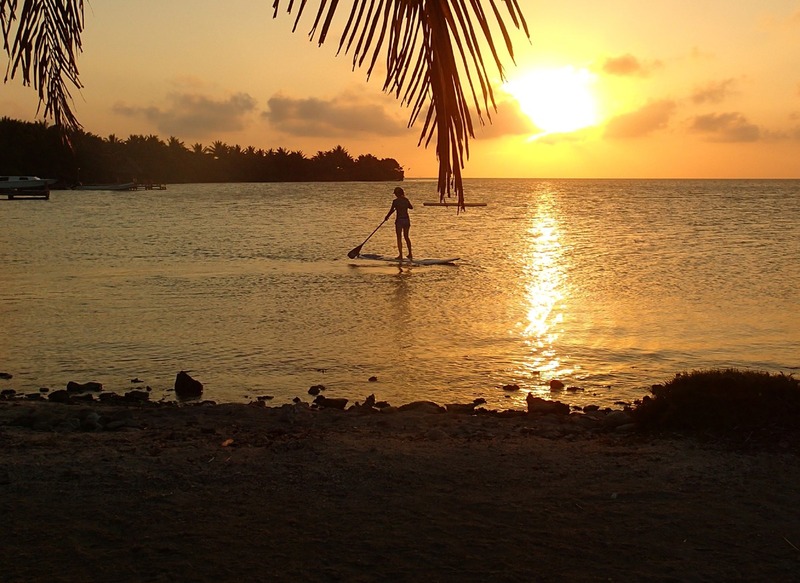 Other options not yet mentioned include a downwind paddleboard trip to Southwest Caye 6 miles away, sunset paddling, night snorkeling, and beginning kiteboarding with our trainer kites, i.e. learning to steer a kite. After lunch we return to Belize City.